PAUL BISHOP ~ WRITER: SPY-FI: ON THE CASINO FLOOR! SPY-FI: ON THE CASINO FLOOR! VIA TIP TOP MUSIC . . .
Two years after their well deserved critically acclaimed sophomore album Where Hearts Go Broke the Seattle-based sci-fi pop band Hotels releases their third album; On The Casino Floor. A seven track concept album that moves their cinematic sound close to fulfillment. 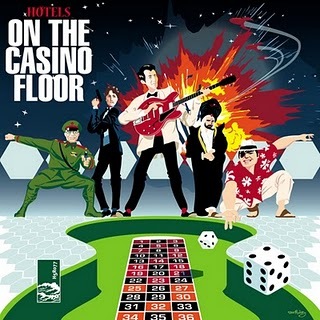 On The Casino Floor tells the story of a secret agent, his former mentor gone bad, and a devious prince's plan to destroy the universe's only space casino complex. Not surprisingly this gives a soundscape made out of spaghetti western images, and romantic Bond-like moves, added just a dash of Star Trek. A most charming combination . . .